Now, the good news is that FX has renewed The Americans for a third season. 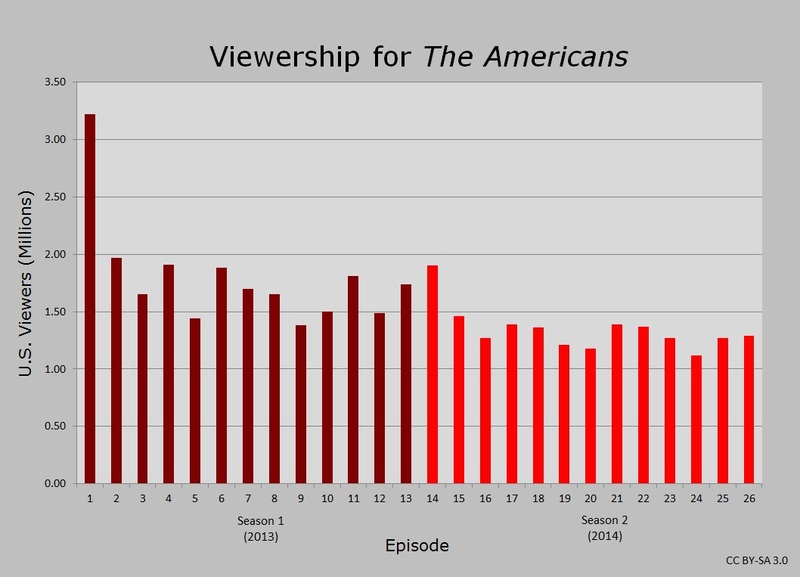 Even so, the viewership numbers (and trend) shown above do not auger well for the long-term prospects of the show. This is disconcerting for me, since (1) I really this this show, and (2) I would like to see how the main characters react to glasnost and perestroika. In the chronology of the show’s plot, season 1 begins in early 1981, a few weeks before the attempted assassination of President Reagan. I believe that season 2 finishes sometime in 1982 (although I’m not certain on that point). At this rate, it will take 4 or 5 seasons before we see Gorbachev come to power and begin to implement reforms. So, we need enough people to watch The Americans that FX won’t cancel the show for another couple years at least. I’m quite the Americans evangelist, for just such reason .. and also because the show is so good, I’m not shy to recommend it. That show needs and deserves good evangelists. Glad you’re on board.